12.06.2014. Georgian winemakers tested the ground on the Russian market once again when they increased their export to the country in 2013 after seven years of an embargo. This contributed to Tbilvino achieving 35% growth in 2013. The company is aiming for an extra 30-35% increase this year. Georgian wine has been greatly welcomed by Russian consumers. The 2006 Russian embargo became a useful learning experience for the company, which went on to change its operations strategy by entering new markets. For the first time in the history of Georgian wines, Tbilvino entered the largest UK retail store Marks and Spencer (read more here). The company has been awarded Silver and Bronze medals in London. In addition, the company won Golden Brand 2013. “2013 was an important year for the industry in general,” Giorgi Margvelashvili, President at JSC Tbilvino, told Georgian newspaper The Financial. “After a very long period, the Russian market reopened to us. This has been a big impetus for the industry. Tbilvino would have managed to achieve 10-15% growth without the Russian market. However, with the Russian market we reached 35% growth in comparison with 2012. 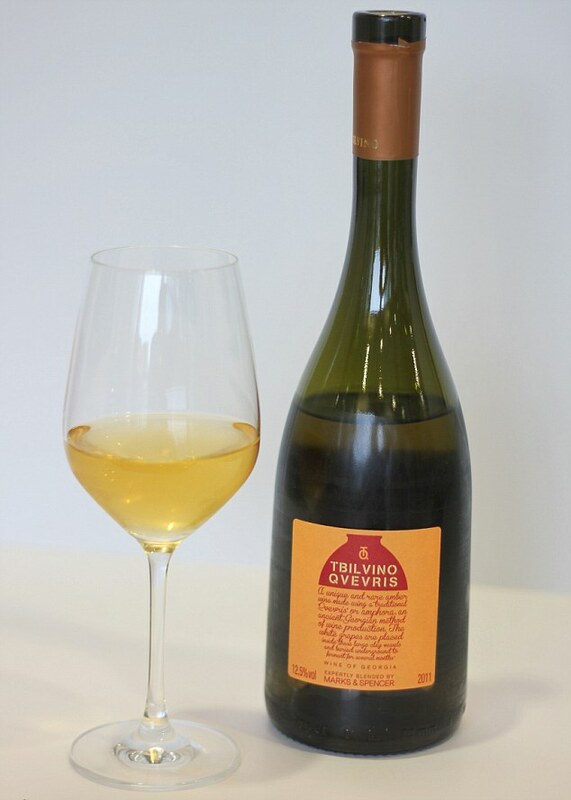 One result of 2013 was that Tbilvino became the largest exporter of Georgian wine, for the fifth time. We produced more than 4 million bottles in 2013. The Russian market made up over 17-18%, significant considering the fact that the first batch was sent in August,” Margvelashvili said. “In 2013 Georgian wine for the first time entered the large UK chain Marks and Spencer. Our products are now sold in more than 100 of the chain’s stores,” said Margvelashvili. “After seven years we have found the Russian market more developed, first of all in terms of the structure. The national trade chain has expanded. These chains are the main retailers of our wine, making up over 80%. The number of alcohol importer companies has been filtered. The number of importers in Russia is reduced. Retail chains initiated the import of wine directly from us, without using middlemen. Georgian wine has been welcomed by Russians, which was really unexpected for us. Many experts predicted that the market would have been replete and that the previous demand would no longer exist. However, the statistics have proved the contrary. During the second half of 2013 the Russian market made up over 50% of Georgian wine export. It exceeded 22 million bottles while the predictions were for less than 10 million. Our attitude towards the Russian market has also changed. Today we consider it to be a market of huge opportunities and undefined potential. However, this market still remains linked with political and economic risks that are characteristic of it. To insure against these risks, we have stated a maximum level that Russia’s share can constitute for our company. We have determined it to be approximately 25%. Keeping the balance between Russian and other markets is important for us. We do not want to be as significantly dependent on the Russian market as we were before the embargo. As well as defining the exact share, we implemented an advanced payment system. We are also regulating it with our marketing budget, which is less than for other markets. Definite quotas have been set for our several wines. Whereas before the embargo we were cooperating with only one trading company, today we have increased this number to four and supply each of them with different brand names of our wine. Besides Tbilvino, we are producing wines under other brand names too, which are: Georgian Valleys, Iveriuli and Adati. Since 2013 there has been huge expectation from Georgian wine producers and the demand for grapes was unexpectedly high. So much so that it exceeded the supply. As a result, the price for Saperavi doubled and got an inadequately high price. This was quite a negative development. It is difficult to assure one’s partners on various markets that it is because the raw material has doubled in price that there has had to be an increase in price for the product. An increased price on products usually reduces one’s competitiveness. Grape price for wine Khvanchkara increased by 100% for example. We did maintain price stability for white wine. As for red wine, it increased by approximately 10-15%. Q. The Russian market makes up over 80% of Georgian wine export. How prudent is that? A. According to the 1Q 2013 results, over 70% of Georgian wine is exported to Russia. The current high demand for Georgian wine from Russia is good. However, this dependence is associated with risks. The industry should work harder to occupy other markets. We should supply the existing demand on the Russian market, however, diversification is important. Georgian winemakers have to combine and increase awareness of Georgian wine in other countries. If combined work fails, then companies should do it individually. Otherwise companies will weaken, and in the event the Russian market faces any difficulties, the industry will find itself in a very difficult situation too. Kazakhstan, Ukraine , the Baltic states, China, Belarus, Poland and Azerbaijan are the bestselling markets for Tbilvino. Q. What if the Russian market becomes closed to Georgian winemakers again? A. If the Russian market becomes closed to us again, their 25% will not be left unsold. I do not think that the Russian market will ever be totally closed again, but some kind of restrictions may be imposed. It might not depend on the two countries’ bilateral relations. Since the beginning of 2014 the Russian Ruble has been devalued, due to its external policy. Accordingly, prices on all imported products in Russia, including Georgian wine, have increased. Our partners have asked to revise our payment policy. In general, post Soviet countries are prone to various fluctuations. There are no written receipts. However, the embargo has brought us high viability. We became more flexible as a result of it. We have faith that the field of opportunities is enormous. We are financially strong and ready for such challenges. Q. Georgia is planning to sign the AA this summer. Do you think that Russia will use the same methods as it did in Ukraine ? A. I do not think that Russia will use the same methods as it did in Ukraine with the signing of the AA. I do not think that the Russian market will become totally closed to us. They have seen that such levers cannot have a negative impact on our economy, as the industry survived despite the embargo; new companies have been established and the existing ones have grown. Q. The ongoing unrest in Ukraine has already had an impact on Georgian wine exporters. What was its impact like on your company? A. We made good strategic actions on the Ukrainian market last year, so the share of our export has not been reduced. We started cooperation with two new importing companies last year, while previously it was only one. These new importers are national trade chains. While our first trade partner reduced realization by 40%, we managed to keep things balanced with the help of two others. We do not expect any growth this year in Ukraine , but maintaining the same figures as 2013 will be considered a good result against the background of the ongoing unrest. Ukraine is a complicated market for us. We faced difficulties there in 2009 when the Hryvnia got significantly devaluated. The past decade has been quite difficult for Georgian exporters in general. However, it has taught us well. After all, what doesn’t kill you, makes you stronger! We are optimistic that the situation in Ukraine will become stable after the elections this year and that a period of improvement will begin. Q. All the difficulties that you have experienced have been linked to post Soviet countries. At the same time we have a very stable EU market. So why remain so strongly linked to the comparatively unpredictable and risky post Soviet markets? A. The western market is very stable. We are also present on its markets. However, its total share of export is low, around 15%. Its stability covers consumption habits and attitudes. Accordingly, switching them quickly to something new is not characteristic of this market’s nature. It takes a long time to attract attention, gain their interest, establish yourself and further expand your share step-by-step. Indeed, Georgia has made huge progress regarding the increase of awareness of Georgian wine among foreigners. There are currently no experts in the world who do not know of Georgia’s merit in the history of wine. They study our technologies. There is huge interest in the Kakhetian method of winemaking via Kvevri. So, the awareness already exists, winemakers have contacts, and the last step is just to increase popularity among customers. Georgian wine meets all the demands for competing on global markets. We hope that Georgian wine will also maintain its competitive price. Price stability is very important. Contrary to Russians, Europeans are more sensitive towards prices. If the price increase will be repeated this year, it will have a negative impact on the industry. The average export price of a bottle of Georgian wine is USD 3.5. Q. What is the share of Georgian wine on the Russian market? A. According to 1Q 2014 data, Georgia is the third largest wine importer on the Russian market, following France and Italy. Georgia recently outstripped Spain. Q. The Government’s intervention in the process of vintage was the main problem before the political changes of 2012. Has this trend changed recently? A. Government intervention in vintage has always been a sensitive issue. As before the opening of the Russian market the harvest of grape exceeded demand, the Government was purchasing the surplus. We partly have the same situation with white grapes. The method has changed though and the Government has not interfered in stating the price which has been very good for us. Last year’s vintage was well-managed as the Government was actively communicating with the representatives of the sector. Q. What are your plans for 2014? A. In 2014 we plan to expand realization by 30-35%. We already had great growth in 1Q 2014 in comparison with the same period last year. We plan to produce more than 5 million bottles this year. Kazakhstan, Poland, China and the Baltic states are characterized by the biggest growth dynamic. A. Georgian wine is unique. Georgian grapes give it an exceptional aroma and taste. It has a strong and memorable taste and combines well with a variety of dishes. The specific type of grape and its region is the main determining factor for foreign customers when choosing wine. Georgian wine is a good discovery for those who are searching for something different. I have never met a customer who has tasted Georgian wine and then not returned to it. Tbilvino is the largest exporter of Georgian wine. This shows that Tbilvino is the favourite Georgian wine of foreigners.